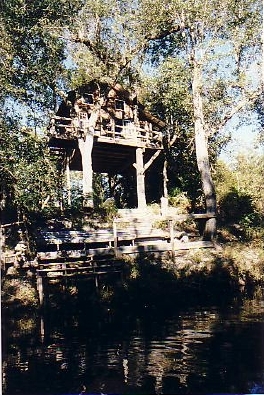 This is the second installment for Just Above Sunset by Phillip Raines about the treehouse in North Florida. We drove south from Atlanta down I-75 and left the expressway at 319 south heading towards Florida. Outside Thomasville we passed plantation row and a series of hunting resorts usually owned by Atlanta blue bloods used as retreats to stalk quail with horses and dogs in elaborate excursions. Crossing the Florida border huge oaks with dangling Spanish moss appeared roadside almost immediately on the new divided highway. Tallahassee is less than a half hour from the state line and I usually prefer to barrel right through the middle of town. It is a college town and the state capital where the architecture is generally old and the traffic is light compared to Atlanta. The mini-van was loaded with a tent, food box, folding chairs, a cooler, three thirteen year old boys, a 150 pound bouvier, sleeping bags, skate boards and generally everything we would need for a week of less than rustic camping, most of our gear on top of the car. We continued south on 319 and passed stretches of woods towards Sopchoppy, the closest town to the treehouse. The highway curves around downtown Sopchoppy and heads towards the coast leaving main street fairly untouched by time. Once the city (that is in fact the designation, though there are larger towns in the county) was a center for commerce and a whistle stop on the way to Carrabelle, a fishing port from the capital. At one time the city of Sopchoppy exported turpentine, lumber and caviar until the sturgeon were all fished out. An industry of worm grunting still thrives there serving the fish bait industry. Locals tromp through the woods, drive a wooden stake in the ground and rub the top of the stake with a piece of steel. Resting their toe against the stake a vibration that sounds like a bull frog is sent into the ground and in the foggy morning the worms rise to the surface to be gathered and sold to a worm broker. An annual festival celebrates worm grunting, complete with parade and a newly crowned queen. Now the population of less than 500 has only a small grocery store, a video store and sandwich shop, and a pizza parlor. Recently a book store opened there, but the dominant piece of architecture is an old rail depot soon to be restored. 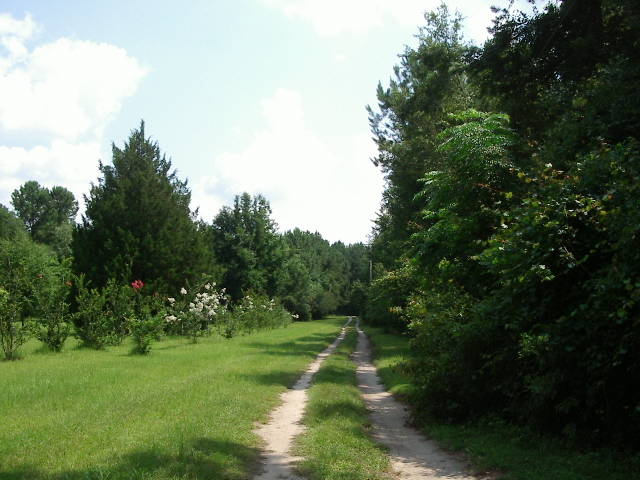 Sopchoppy is surrounded by national forest and the vast St Marks wildlife refuge. Dotted along roads are small farms and a few neighborhoods (houses with lots one to seven acres if that can be called a neighborhood). The rest of the land is deep woodspines that stretch in random depths with scrub along their black trunks, palmettos splayed with leaning fronds, cypress and oak trees and swamps. There are abundant rivers and creeks there and kayaks or canoes explore them daily. After the six-hour drive everyone piles out of the car and unloads luggage and I begin my scout master duties of setting things up. The boys put on their bathing suits and are in the river as soon as possible. Whoops and screams clear any wildlife away as they splash in the water, leaving only a few horse and dragonflies not frightened. I put up the tent where they will sleep and leave pumping up the air mattresses to them. My wife, Kathy is busy in the treehouse putting sheets on the mattress in the loft and sweeping the dust away. I set up the kitchen below the treehouse. I put on my swim trunks and am just about to dive in the river when my friend Nelson drives up. A remarkable guy, Nelson helped me build the treehouse and is one of the reasons I bought land there. He is a naturalist, carpenter, and thatches roofs with palm fronds gathered in the woods. His thatched huts can be found on beaches and rivers all over the county. He also is partners with two other fellows who own the pizza place, and outfits kayak and bike tours. An avid reader and son of a professor, his parents bought land here when his father taught at FSU in Tallahassee. "You getting in?" he asked, standing at the top of the stairs leading to the dock. "You're wearing trunks," he plainly stated, settling on the bench beside me. "Luke's classmates would be traumatized if they saw his dad naked. Did you bring trunks?" He scoffed and said "Jesus made my bathing suit." He pulled off his t-shirt, kicked off his shoes, dropped his jeans and dove off the dock into the river. "Perfect," he said and started swimming upriver to the sand bar. 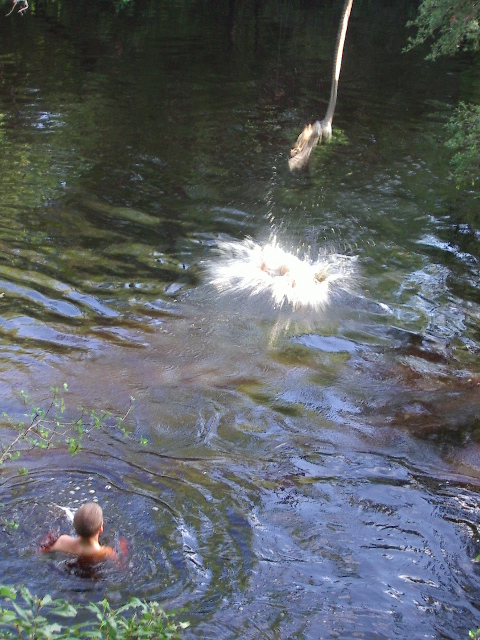 I dove in right after him, swimming at a good clip against the current. We reached the sand bar together and stood in waist deep water with our arms folded. In the distance around a bend in the river we could barely see one of the boys swinging on a rope past the peninsula and the leaning oak tree. That is the main swimming hole where the banks are steep and the water is deep. We floated back down stream to the dock and went up the stairs to the kitchen beneath the treehouse. Kathy had beers out and chips and salsa and was sitting in a folding canvas chair looking in the direction of the boys. The dog had already taken a swim and was lying in the cool bricks I had paved with the boys last summer. There was till firewood left from camping earlier this summer and Nelson had brought a big piece of fat lighter to make our fire starting fast and successful. Fat lighter is pine and pieces of it can be found in the woods there where a pine tree has died, burned or rotted, leaving a post in the center of the stump. All the turpentine concentrates to the core of a damaged tree and turns the wood a rich amber, almost crystalline and impregnated with sap. Taking a piece of this wood and shaving off curls on one side a single match will start it blazing and will burn a hot yellow flame that will in turn ignite a huge pile of wood in minutes even if the firewood is damp. We begin a fire that we'll use to cook burgers for supper. 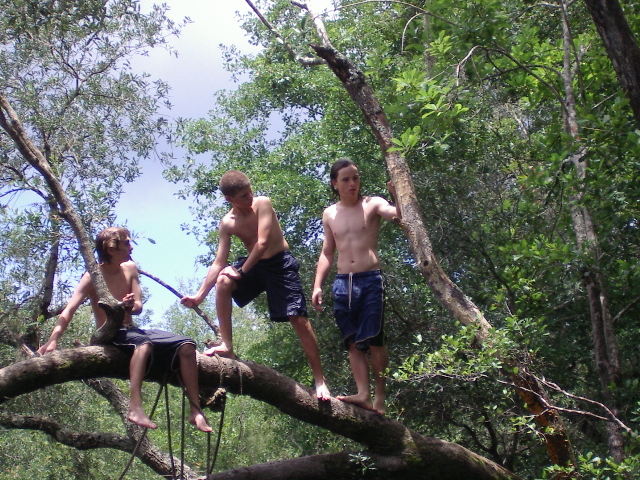 The boys are taking turns climbing a tree twenty feet in the air using wooden blocks as a ladder nailed to the tree by some local boys who use this swimming hole. 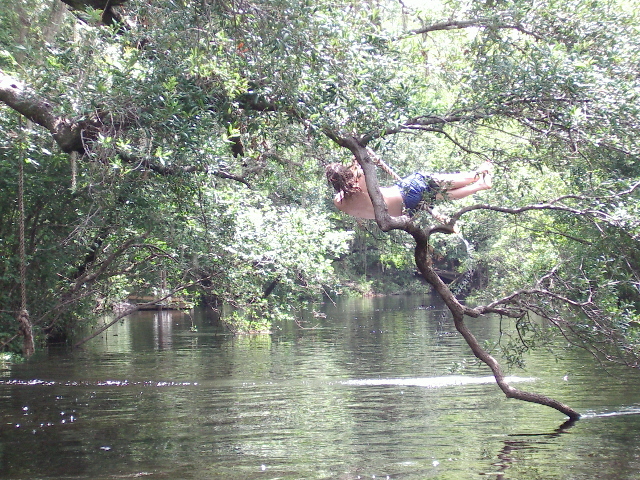 The tree leans out over the river and the boys jump out into the dark deep water. No cannon balls, no flips - it takes enough nerve and skill just to stand in the cook of a dead limb and leap out away from the tree. They go between the high platform and the rope swing, trading off one thrill for another. One boy is scooping up tadpoles that huddle near a ladder where they climb out of the water. This is the last afternoon that will be free of thunderstorms. It has rained for an hour almost every day this summer, Nelson tells us, though the bugs are very light for some reason. Some trips we spray the campsite with yard guard to keep down the mosquitoes and drive away the chiggers, but not so on this trip. The sun begins to set and the deep orange it paints on the bottoms if the blue/gray clouds contrast with the clear patches of sky. All these colors show in the river in perfect reflection. The boys come out of the river dripping after a long swim and stand around the fire and start asking about supper. Luke (my son) asks if they can swim at night after they eat, I think just to razz me. It is a familiar argument about night critters in the water, and gators and otters and not being able to see what you're doing, but I know all that just makes it more thrilling, but I am not easily swayed. This is good, having my own private campsite. It's rare that anyone uses it other than my family, though we have had covered dish suppers with neighbors when we were building it. We went through long stretches not coming down and lost touch with a lot of friends there. To us the deep woods are so exotic and primal, a huge relief from the city where we live. After supper and dishes we will retire early and read ourselves to sleep, leaving the boys to talk in the tent as the campfire turns to coals. A pair of owls calls out to each other loudly above the steady drone of crickets and frogs. I plug in my laptop and sit on the sofa to write for an hour as the chatter of the boys in the tent becomes quieter I know they are finally asleep. It is only ten and everyone, even the dog, is fast asleep. Tomorrow we will hike up river to the national forest. The quality of light there is like nowhere else I have ever seen. This is the second installment of treehouse chronicles. In the next installment Phillip will describe some of the other destinations near the treehouse in Florida's panhandle. The editor of Just Above Sunset and Phillip would like to acknowledge the efforts of Rick Brown in Atlanta who assisted in the task of editing and resizing a number of the photographs here.